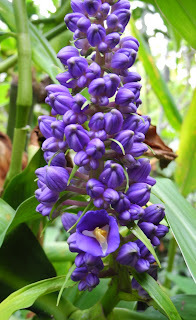 In a shady tropical grotto of our greenhouse, a number of tropical plants thrive, and one of most handsome is the blue ginger (Dichorisandra thyrsiflora), which while quite blue (leaning toward purple) this is not a ginger (Zingiberaceae) at all but a member of the spiderwort family (Commelinaceae). It has a rhizome, aerial stems that reach 4-6 feet, and a helical arrangement of simple leaves, and that describes a large number of tropical monocots. This particular plant just started flowering (only one flower is open), so the display is quite large and fairly dramatic. While easily grown, and therefore fairly common, in glasshouses, blue ginger is too big and likes too much humidity to be an easy house plant.